How to Find Security Issues in Your Microsoft Network! Play How to Find Security Issues in Your Microsoft Network! Security analysis has become an important tool in our overall security strategies. Often we are unsure whether or not we have too many security dependencies in our Microsoft Network. We don’t how many Admin accounts are exposed on clients and servers, if the latest patches really are installed, and so on. During this session, Marcus Murray will demonstrate how you can perform a security analysis on your internal clients & servers and, using a step-by-step approach, identify common security issues. You will learn about the tools needed and how to use them, how to interpret the output, and what to do with the result. 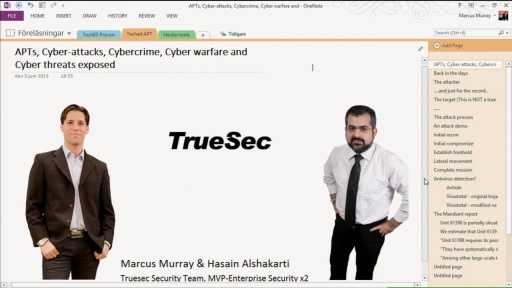 This session is very valuable if you want to be able to perform effective security analysis in your own Microsoft Network. TWC: Why a Hacker Can Own Your Web Servers in a Day!